CELLPHONE is Michael Wirth Broth, Eric J Farber (Easy Boy, Truman Peyote), JM Leon (Easy Boy) & Alex Janssen (Guy Dallas, VOWLS). They are a synth-punk group that exist somewhere between the tri-axis of Miami, Boston & Toronto. 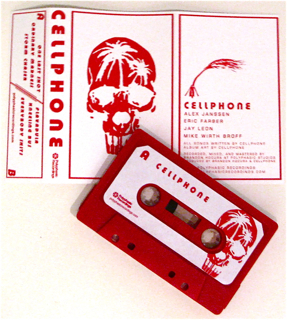 Imagine a pubescent Black Flag with a 707, Juno 60 and Futurisk fetish and you might be close to the sound storm on this cassette. Recorded, mixed and mastered in Polyphasic Studios. ESSENTIAL! Named after the Brian De Palma film about the intimacy and invasive nature of sound recording (in his case a metaphor for filmmaking), this EP finds Toronto’s VOWLS eavesdropping on Pop music. The a-side Burlap swaggers around a drum machine beat that sounds like a New Order 45 played at 33rpm, with thick psychedelic layers of hazy MBV keys and VU ur-strum. The b-side is a much darker affair, which starts off with a creeping dub bassline surrounded by swirling electronic buzzes and floating voices. It then evolves into a throbbing call and response dirge that calls to mind Joy Division as much as it does Aphex Twin.